Reason 1. DISM tool cannot find online (in Windows Update or WSUS) the files needed to perform the repair, when using this command: "DISM /Online /Cleanup-Image /RestoreHealth"
Reason 2. You have specified a wrong Windows Image (install.wim) file as the repair source, when using this command: "DISM /Online /Cleanup-Image /RestoreHealth /Source"
How to Extract an INSTALL.WIM file that contains several INSTALL.WIM files. In this troubleshooting guide you will find several methods to resolve the following DISM errors: "The Source Files Could not be Found", "0x800f081f", "0x800f0906", "0x800f0907". How to FIX: DISM /RestoreHealth Could not Find Source Files to Repair Windows 10 or Windows 8/8.1. Method 1. Clean and Analyze the WinSXS folder. Method 2. Specify an alternative Repair Source in DISM by using the /Source switch. Method 3. Specify an alternative Repair Source by using Policy Editor or Registry. Method 5. Fix DISM errors by examine the CBS.LOG file. The Windows Component Store folder, aka WinSXS (C:\Windows\winsxs), contains all the files needed during servicing operations in Windows, such as the installation of updates, hotfixes, etc. Additionally, the WinSXS folder, contains all the files needed for a Windows installation or repair. 1. Right click at Start menu and select Command Prompt (Admin). 4. After the restart, open command prompt (as admin) again and run DISM. 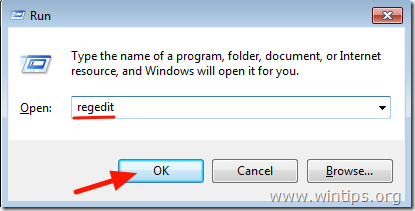 By default DISM looks online to find the required files to repair the Windows Image. But in most cases, this doesn't work, so you need to specify a local source for the known good files by using the /Source switch. Requirements: To accomplish this task you need the install.wim file (X:\sources.install.wim), from a Windows installation media (USB, DVD or ISO), that has the same Windows version, edition and language with the installed version. 2. If you have used the Windows ISO Downloader tool (option B), to download Windows 10/8 ISO, then you may need to extract a Windows Image (according to the installed Windows version) from the install.wim file (X:\sources\install.esd) file, by using these instructions: How to Extract an INSTALL.WIM file that contains several INSTALL.WIM files. 1. Attach the Windows installation media on your system. 2. Right click at Start menu and select Command Prompt (Admin). 6. Be patient until DISM repairs the Windows image component store. * Note: If the DISM tool fails again with "Error 0x800f081f: The Sources files could not be found", then read this guide before proceeding to the rest methods. The problem has – probably – occurred because the install.wim file, contains multiple install.wim files. 9. When the SFC scan is completed successfully, you 're done! Method 3. Specify an alternative Repair Source by using Policies or Registry. 1. Copy the install.wim file from the Windows installation media (e.g. (X:\sources.install.wim) to the C:\ drive (root folder). 2. According to your Windows version (Pro or Home), follow the instructions below to specify the C:\install.wim file, as the default source to repair the Windows Image. 2. 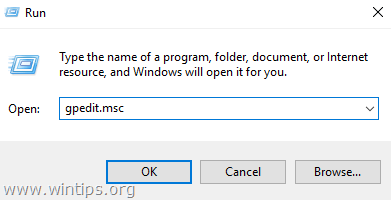 Type gpedit.msc and press Enter to open the Local Group Policy Editor. 4. 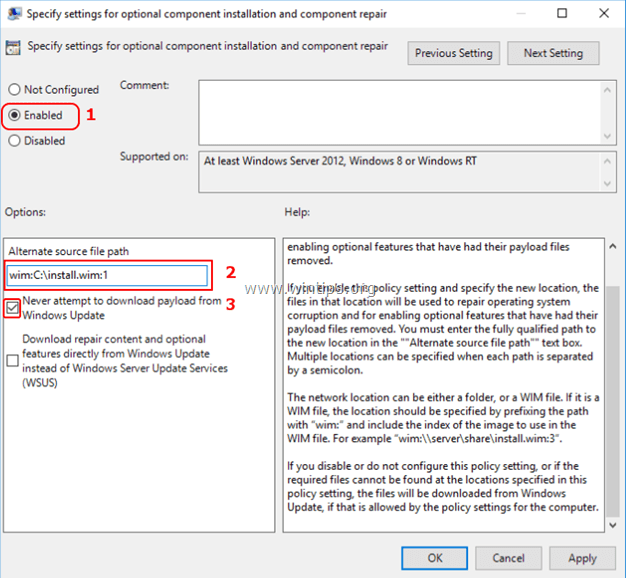 At the right pane open the "Specify settings for optional component installation and component repair" setting. 6. Click OK and close Policy Editor. 8. After the restart, run the "DISM /Online /Cleanup-Image /RestoreHealth" command again. 10. When the repair is completed, then undo the changes in Policies. 1. Press “Windows” + “R” keys to load the Run dialog box. 2. Type regedit and press Enter to open the Windows Registry Editor. 6. Highlight the Serving key. 11. Right click again at the right pane, and choose New > DWORD (32-bit) Value. 15. Close registry editor and restart your computer. 16. After the restart, run the "DISM /Online /Cleanup-Image /RestoreHealth" command again. 17. When the repair is completed, then undo the changes in Windows Registry. Method 4. Fix DISM Source Files Cannot be Found Error with Windows Repair Upgrade. The other method to fix DISM errors is to perform a repair upgrade of Windows 10. Step 1. Repair/Upgrade Windows 10 by using the Media Creation Tool. 1. Download and run the media creation tool according to your OS Version. 2. Accept the License Terms. 3. Choose the option Upgrade this PC now and press Next. 4. Wait until Windows is upgraded. Step 2. Use DISM and SFC tools to complete repairs. After it's execution, DISM creates a log file named "CMS.log" at "C:\Windows\Log\CBS" directory (e.g. C:\Windows\Log\CBS\ CBS.log), that captures any issues found, when DISM command tool is executed. So, the last method to fix DISM's "Source Files Cannot be Found" error, is to examine the CBS.LOG file, in order to find out and remove the installed package(s) that causes the problem. Step 1. Examine DISM's log file (CBS.LOG). 1. Navigate to C:\Windows\Log\CBS directory and open the CBS file. 2. Using the Find tool (View > Find), search for "Checking System Update Readiness". * e.g As you can see at the below screenshot, the corrupted package is named: "Microsoft-Windows-TestRoot-and-FlightSigning-Package~31bf3856ad364e35~amd64~~10.0.15063.0"
4. Once, you find out, the name of the corrupted package, then continue to the next step. Step 2. Remove the corrupted package's registry entry. 1. Simultaneously press the Windows + R keys to open the RUN command box. a. From the main menu, go to File & select Export. b. Specify a destination location (e.g. your Desktop), give a filename (e.g. “RegistryBackup”) and press Save. * Note: Save the registry keys on your desktop, in order to easy import them backup if something goes wrong. (Double click at the exported key(s) and Merge). 1. Right click on each key and select Permissions. 2. Highlight Administrators, place a check mark on Full Control checkbox and click OK. Step 3. Move the corrupted packages to other location on disk. 1. Navigate to C:\Windows\Servicing\Packages folder. 2. Now find and move to your desktop, all the packages that their name begins with the name of the damaged package in the CBS.LOG. 4. Run the "DISM /Online /Cleanup-Image /RestoreHealth" command again. 5. If DISM is completed without errors, then proceed and delete permanently the exported registry key(s) and the moved packages from your desktop. Good luck! Let me know if this guide has helped you by leaving your comment about your experience. Please like and share this guide to help others. Thank god for this webpage. I kept trying each item going down the page and failing. But the windows media creation tool step did it. I'll send you a few $ if you have a patreon account. Had an error enabling .NET Framework 3.5 on W10. 5) Run "dism /Online /Enable-Feature /FeatureName:WCF-HTTP-Activation /All" <- Yay! I'm troubleshooting an issue with my GPU mining rig running the trial version of Windows 10. Suddenly, multiple different mining applications didn't recognize any of my AMD graphics cards, but they were shown in Device Manager. I noticed that I was getting the notification "Application has been blocked from accessing graphics hardware", which brought me here. DISM couldn't find the source files (error 0x800f081f) and also wouldn't recognize the install.wim file from the freshly downloaded ISO. Ultimately, Method 4 worked and a repair was successful. Thank you very much for taking the time to create such a thorough guide! Just wanted to thank you for your excellent instructions how to fix this issue. Your article is the only one I found that helps people like me who aren't that computer savvy. In the end, I had to do a non-destructive Windows re-install to fix the update error. Even though the descriptions of the different methods are very clear, I wasn't able to solve the problem yet. I feel like I'm going in circles from one method to another now without making any progress. So If anyone could give me any hints based on the log file below I would be very grateful. 2018-11-04 14:33:51, Info CBS Repair failed: Missing replacement manifest. 2018-11-04 14:33:51, Info CBS Last Successful Step: Entire operation completes. Win10 Home. After try almost everything, couple times, i've been finding for any 'manually' approach. The 5th method – the log, the log!- seems to finally solved my problem. Man… I've spent months trying to fix this error on and off. Went through every fix on all of these pages… except reinstall, which finally fixed it. Next time, I'm just reinstalling!!! Easy peasy! Hi I cant find those files in regedit, I cant repair it please help. Repair failed: Missing replacement manifest. Total Operation Time: 1390 seconds. Thanks , I tried all the steps. @Kaan: I think that the needed files belongs to a third party app. I suggest to repair Windows 10 with an in=-place upgrade. Thank you very mcuh for your help. I think there are no solution left than make that reset to keep my files. Also I will ask a question. Can I keep using windows like this. My Windows 10 Home 64-bit system suddenly started acting weird. I ran an sfc /scannow and noted 4 corruptions: fdeploy.dll, fde.dll, gptext.dll, and gpedit.dll. Never even got to the DISM /Online /Cleanup-Image /RestoreHealth step. Is that even possible? Could sfc/scannow have cleaned things up without the RestoreHealth, given the stated corruptions? Or is this just one of the Microsoft mysteries? @George Sinkinson: I suggest to run all the commands mentioned at the method 1, to ensure that your system is OK. Thanks. It was impossible to correct using DISM. Everything was correct, like path, Windows version. The outcome was always source not found. However method 4 worked. Sfc came out successfully and so DISM and errors gone. and then examining the bottom of the C:\Windows\Logs\CBS\CBS.log file to see exactly what the problem(s) is(are). Then search the Internet for possible solutions. In this case, it appears that someone at Microsoft left a "testroot" in the packages of the production version of Windows 10 when it shouldn't have been there. 2. I exported each of these two registry entries to my desktop for safe keeping, just in case I needed them later. 3. Then I changed the permissions on the two registry entries giving myself full control. 4. Then I deleted both registry entries. 6. I MOVED all 4 to my Desktop for safe keeping, just in case I needed them later. The reboot went perfectly and, as you saw above, "DISM /Online /Cleanup-Image /ScanHealth" and "SFC /Scannow" both work perfectly. Thank you for the info and I 'm glad that you found the solution. Thanks a lot for this information! After a year it still helps people who still have this problem. 2. After SFC > Restart your computer. DISM /Online /Cleanup-Image /StartComponentCleanup completed successfully with no comments about fixing anything. SFC /SCANNOW just said "Verification 100% complete. Windows Resource Protection did not find any integrity violations.". Step 2: The computer restarted normally. @Stu Berg: Definitely this is a Windows bug and I 'm afraid that the only option is to perform a fresh Windows 10 installation. p.s. have you tried Method 2 & Method 3 from this article? 2017-05-11 08:07:01, Info CBS Repr: CSI meta data corruption found, will commit repair transaction if repair is asked. Look for the posting by DAC324. What do you think? Should I try it? I am downloading windows 8.1 media creation tool , why it is very slow. @jennie: The download speed is slow because of Microsoft servers. Lakonst, thanks for your reply . I have downloaded for 24 hours day and night. How long would it take to get all files ready? On the installation screen, there does not show how many percentage of files have been downloaded, only show “ estimating time” characters, but there is no any exact estimateing time indicated. Also, I did not see any files downloaded in my USB drive. @jennie: I suggest to stop the current operation/download and then to restart your computer. After restart start the Media Creation tool and try to download Windows 8.1 again.